Where to Buy DuPont Classic Herbicide, DuPont Classic 25DF Herbicide - 10 oz - $179.95 for Sale with Fast Free Shipping! 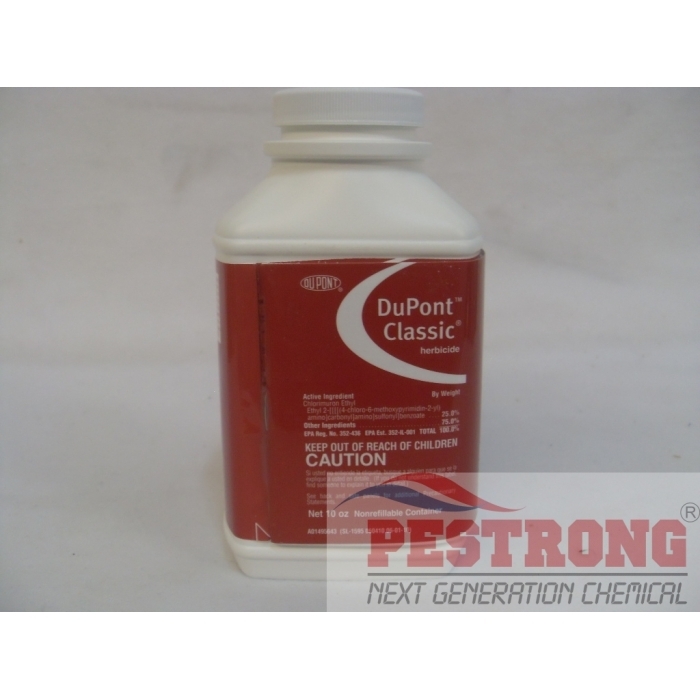 DuPont Classic 25DF Herbicide - 10 oz provides selective postemergence control of actively growing weeds in soybeans and peanuts. By buying this product & leave product review you can collect normally 17 reward points as a voucher of $1.70(1%). DuPont Classic Herbicide provides postemergence control of key weeds, including morningglory, velvetleaf and yellow nutsedge in soybeans, while residual activity helps keep fields clean. Classic is an excellent tank-mix partner with other postemergence soybean products to expand the weed control spectrum. Classic improves control over glyphosate alone of key weeds, such as morningglory, hemp sesbania, yellow nutsedge, and velvetleaf. Based on weed size and spectrum, Classic allows you to adjust the rate of application to meet your needs. Classic provides selective postemergence control of actively growing weeds in soybeans and peanuts. Classic has a flexible rate range, depending on weed size and spectrum. Classic may be applied by ground (broadcast or band) or by air. Classic may be applied any time after the first trifoliate has opened but no later than 60 days before soybean maturity. Rate : 1 ~ 3 oz per acre (This 10 oz covers up to 10 Acres) The rate will be vary depends on the crop. See detail for Label. Classic may be tank mixed with glyphosate products, Flexstar, DuPont HARMONY GT XP, ASSURE II or other registered soybeans herbicides for increased weed control. This product works great on soy beans. I would purchase this product again.